Scraping product, prices and stock information from an eCommerce competitors websites is one of the real business use of web scraping. And most of the eCommerce companies rely on web scraping software's for price comparison, and uses this technique to compare their price to find out if they are offering the best price in the competition or not. And then strategic planning to increase margin-profit. This entire process is called "competitive pricing analysis" or "pricing intelligence" in business. In this tutorial we will learn how to extract price from a simple product list website (category or search result page) from an eCommerce website. Go to the the website page you are looking to extract products from and then enable the extension by clicking on the extension icon on right corner of browser. Click on the New button to add fields and "Asterisk (*)" button generate selectors for any HTML element you are looking to extract. When you are satisfied with the extracted result preview click on the "Save" button to save this web scraper agent to Agenty cloud application where you can use the features like scheduling, batch url crawling and more advanced options to automate the screen scraping to extract prices from websites. 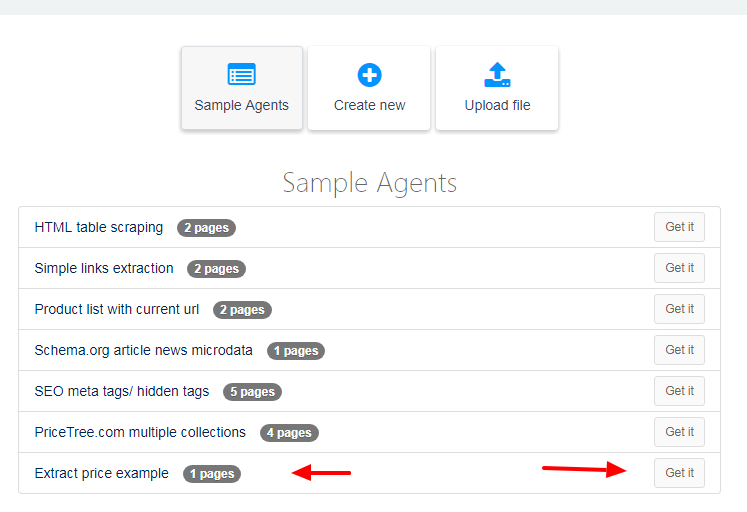 Now login to Agenty and you'd see your agent in your "Scraping Agents" list or on your "Dashboard" where you can start the agent to scrape the data or schedule that to run when you want. In the screenshot below I ran the agent and it extracted the product and pricing details in table below. Wants to try on your own? Try it out and let me know what you think in comments below.